Diabetic neuropathy is a progressive condition in advanced diabetic patients. 70 percent of the patients suffering from diabetes suffer due to nerve damages in the later stages of the disease which is caused due to uncontrolled glucose levels in the blood and hypertension. Diabetic neuropathy is expected to increase over time and the treatment for the damages caused to the nerves, include blood sugar management, anti depressants, control of blood pressure levels and inclusion of medications and drugs to prevent further advancement of diabetic neuropathy. Patients who have managed to live with diabetes for over 25 years have a higher risk of having diabetic neuropathy. Patients who suffer from high levels of cholesterol and high blood pressure are more liable to be diagnosed for diabetic neuropathy. These conditions lead to cardiovascular problems which is associated with poor blood circulation and damages to the blood vessels. The development of cardiovascular diseases leads to reduced blood supply and oxygen to the nerves. This causes progressive nerve damages in the diabetic patients in the advance stages of the disease. Certain unhealthy lifestyle patterns such as excessive smoking and regular consumption of alcohol can lead to the development of serious nerve damages in the diabetic patients. 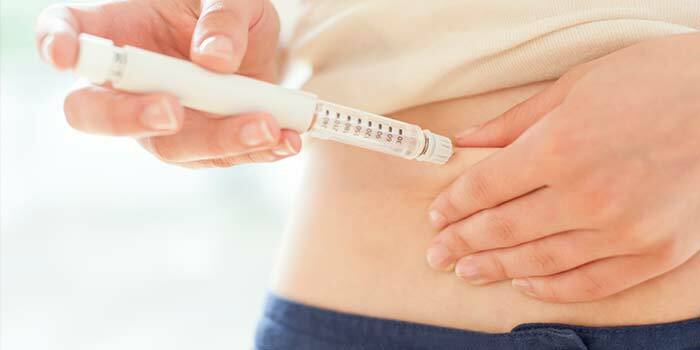 Type II Diabetes typically develops due to high insulin resistance. The body cells find it difficult to use the insulin properly and some cases there may be an absolute deficiency of insulin in the system. As a result, the normal functions related to the breakdown of sugar in the blood stream fails to take place, leading to an increase in the blood sugar levels. If the patient has been suffering from diabetes mellitus for a long time, then the administered insulin units fail to keep up with their proper performance level. The increased blood sugar levels trigger off nerve damages, that lead to further complications. It is very important to avoid situations that lead to undue fluctuations in blood sugar levels that lead to hyperglycemia and Hypoglycemia. Failure to keep up with the dietary recommendations, lack of proper exercise and activity levels, not taking oral medicines and insulin at the proper time, failure to cope up with physical and emotional stress, negative patterns of thinking and an overall improper approach towards life, lead to the increase in blood sugar levels that causes the advanced symptoms of nerve damages, vision issues and foot problems in diabetic patients. Some diabetic patients have an inherent nature of taking undue stress which increases their anxiety levels. They also suffer from short temper and get angry very easily. The difficulties faced in anger management can lead to high blood pressure levels that can affect the nerves in an extremely adverse manner. Taking on undue physical, emotional or work related stress can also cause pressure on the nerves, which have weakened with age and other health complications. The patients diagnosed for diabetic naturopathy need to practice self control over their emotions and practice relaxation techniques to control their levels of stress. The causes leading to diabetic neuropathy should be understood carefully as the prevention of further deterioration in the patient is dependent on the proper management and handling of the same.